Want a little inspiration? Free information? Want to sell more of your Art? Tune-in to my guest appearances on podcasts, webcasts, and blogs. NOTE: The special offers at the end of these podcasts and video are expired, but use the code ARTBLOG to get a $10 discount. Inspirational podcast interview with Art Fair Insider's Connie Mettler that will help you find homes for your art. Connie Mettler and I got together recently to talk about the E’s of Selling Art System. It quickly became one of the most inspiring interviews ever. This is full of gems – a full hour of gems. Another interview by Connie Mettler of Art Fair Insiders. We discussed email marketing best practices for artists. There's a world of good here! Conference call interview for Alyson Stanfield's Inner Circle of Artists. “Put Your Business Cards Away “ This just made the top ten list on Artsy Shark for 2014! A must read! And the comments are worth a read through, too. “Confessions of a Professional Art Gallery Closer” It was a great AHA! moment that I truly love to share. “What is Affordable Art” Many who read this admit to becoming a bit teary-eyed. “Wholesale Made Easier” Anyone thinking about getting into wholesale will want to read this. This is a three part series on starting up with new wholesale accounts. Love for Your Collectors Begins with Empathy Art Biz Blog readers loved this one! Want to close more sales? A Template Letter for Informing Collectors of a Price Increases Some debating occurred, but it’s all good. Additional Interviews about the E's of Selling Art System are now being scheduled. Are you an art blogger, art business coach, or speaker? Let’s work together to bring expert and valuable in information to your members, subscribers, or clients. Do you run an art school or art related organization? I offer a wide range of art business and marketing subjects all designed to overcome the specific struggles artists encounter. Call 808-283-2108 or click to email me to discuss collaborations that will add value and impact to your brand while bringing critical knowledge to the artist community. 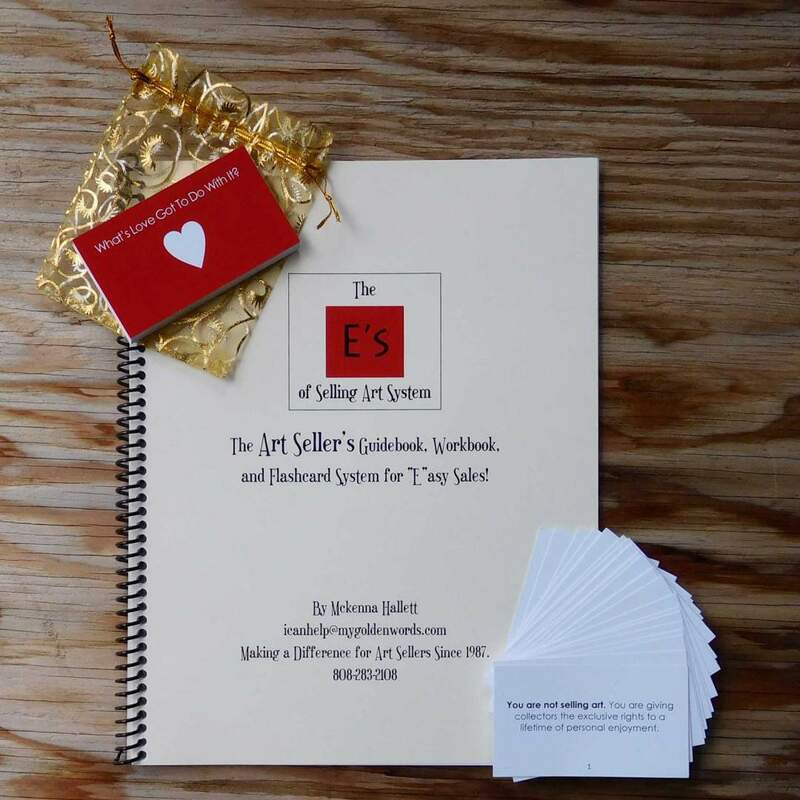 After 30 years of sharing the E’s of Selling Art Seminar directly to the Artist Community, Mckenna now has focused on a complete and portable selling system. The guidebook and flashcards are moving the needle for artists around the globe.